In June 2011, fighting erupted between Sudanese government forces and the Sudan People’s Liberation Army-North, or SPLA-N, in the Sudanese state of South Kordofan. The precipitating cause for the violent clashes was the disputed result of a gubernatorial election, which pitted a candidate from Sudan’s ruling National Congress Party, or NCP—who is the subject of an arrest warrant for crimes against humanity issued by the ICC—against a candidate from the SPLAN’s political wing, the Sudan People’s Liberation Movement-North, or SPLM-N. By September of that year, fighting had spread to the neighboring Blue Nile state. The grievances of the SPLM-N and its supporters, however, run deeper than an electoral dispute. The opposition is rooted in the inequitable manner by which the NCP regime rules Sudan. The NCP, like its predecessors, politically, economically, and socially marginalizes populations on the country’s periphery. This systematic marginalization has led people in South Sudan, eastern Sudan, and Darfur to revolt against the central government, which resulted in the violent conflict that has beset Sudan since it gained independence in 1956. In response to these uprisings, the Sudanese government has resorted to using indiscriminate bombardment (aerial artillery) and ground assaults, the destruction of villages and the means of food production, and the blockade of international humanitarian assistance to target civilian populations whom the government perceives to be supporting armed insurgents. The government’s brutal response to uprising on the periphery has taken an immeasurable toll on Sudanese civilians. During Sudan’s second civil war—which took place from 1983 to 2005—these tactics led to the deaths of 2 million civilians and the displacement of 4 million in what is now South Sudan. Independently, the ongoing conflict in Darfur has resulted in the deaths of approximately 300,000 people and the displacement of an additional 3 million people. In response to these atrocities, the U.N. Security Council referred the situation in Darfur to the ICC, which in turn issued arrest warrants against Sudanese President Omar al Bashir, Minister of Defense Abdelrahim Mohamed Hussein, and South Kordofan Governor Ahmed Haroun on allegations of genocide, crimes against humanity and war crimes. Sudan’s regular military forces—the Sudan Armed Forces, or SAF— along with the country’s Central Reserve Police, known as Abu Tira, and the government-supported Popular Defense Forces militia, or PDF—are now using these same tactics against civilian populations in the South Kordofan and Blue Nile states. 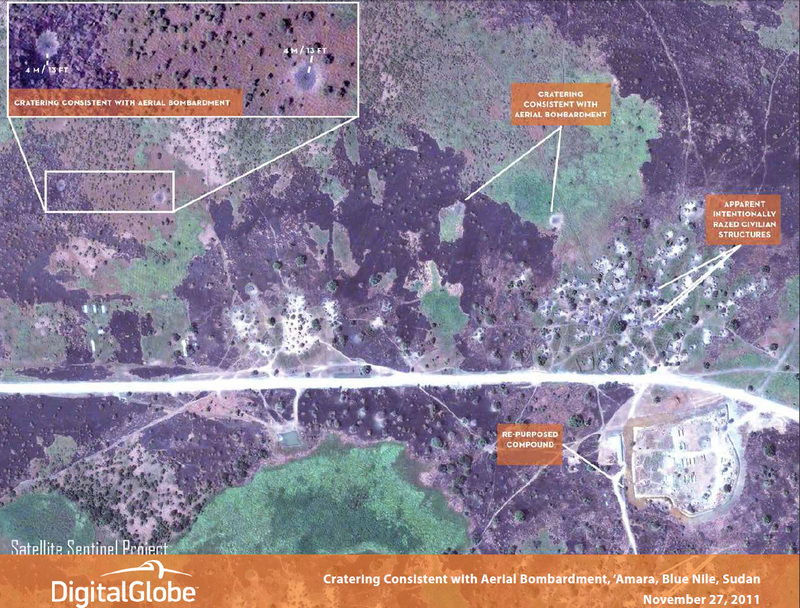 SSP’s examination of DigitalGlobe satellite imagery and information from multiple sources—including eyewitness reports, photos and videos, as well as open-source documentation—reveals that the government of Sudan and its agents have likely committed war crimes, crimes against humanity, and torture in the South Kordofan and Blue Nile states. While the potential evidence that SSP has gathered does not indicate that the Sudanese government is committing genocide in these areas, the ICC or a U.N. commission of inquiry needs to conduct further investigation on this issue. Ongoing violence and Sudanese-government-imposed restrictions on travel into the two states limit SSP’s ability to gather information in a comprehensive manner. Establishment of a U.N. commission of inquiry is therefore necessary to uncover the full extent of the Sudanese government’s actions. Further investigations by the U.S. government and other international actors could also help. Additionally, expanding the ICC’s Sudan mandate to permit investigations in the situation in the two states could be part of a broad international effort to stop the violence in South Kordofan and Blue Nile.